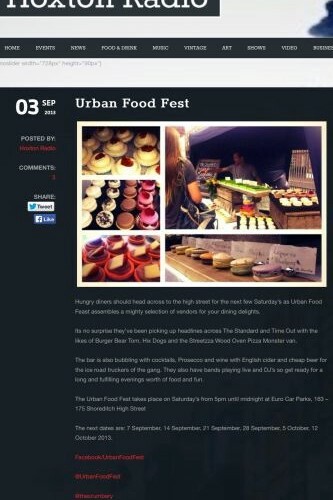 Review: Hungry diners should head across to the high street for the next few Saturdays as Urban Food Fest assembles a mighty selection of vendors for your dining delights. Its no surprise they’ve been picking up headlines across The Standard and Time Out with the likes of burger and the Wood Oven Pizza Monster van. The bar is also bubbling with cocktails, Prosecco and wine with English cider and cheap beer for the ice road truckers of the gang. They also have bands playing live and DJ’s so get ready for a long and fulfilling evenings worth of food and fun. Hoxton Radio caught up with Jess who organises the event and gave us a taster of what’s in store and where she likes to go for food in East London. 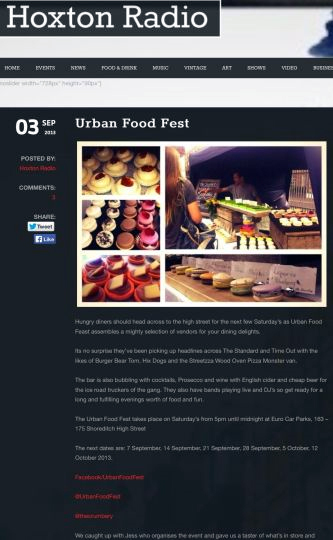 Review: Occupying a small car park, just north of Shoreditch High Street Station, Urban Food Fest is well positioned and easy to find with brightly coloured food trucks squeezed together in a tight arrangement leaving you to gape at the bewildering choice on offer. Closing my mouth and wiping the dribble from my chin, I opted for the vendor with the shortest queue. Clearly, Shoreditch residents live on the edge, but not close enough to try frogs legs and sweet potato fries. It’s a shame because the legs are like small tender pieces of chicken, clinging to a fragile bone, coated in a hot dry dusting of spice – simply delicious. The fries are a nice warming accompaniment, too delicate for fingers, great with a forkful of coleslaw to cool a previous mouthful of hot frog. The second course was the goal of my quest. No sooner had the Korean street food truck tweeted about their double-fried chicken in sweet sticky chilli, than I had the date down in my diary. We went for a soy marinade in the end – those frogs still tingled my tongue – and the chicken arrived in a dry, almost tempura-like batter, piled in a paper tray above a small dribble of the marinade for some dipping action. An excellent choice alongside a cold beer. Tempted next by an Argentinian empanada, I realised the limitations this would pose upon pudding and went instead for a final course of yet more batter. Lightly sugared with a chocolate dip, churros is one of those foods I could eat continuously until caught by a heart attack. 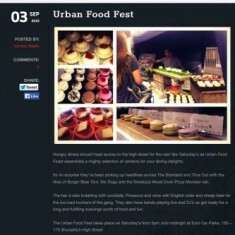 Urban Food Fest gives residents and visitors to Shoreditch options come rain or shine on a Saturday evening. It’s a good place for a snack, three course meal, or, if you get your drinking hat on, the start of a night out. Oktoberfest heads to Shoreditch bringing traditional German food, drinks and music as Urban Food Fest celebrates with three weeks of themed markets. Deutshcland delights go down with 15 street food traders serving up giant hotdogs & sauerkraut, triple stacked beef and pickle burgers plus deserts of black forest cherry waffles and apfelstrudel crepes. The cocktail bar includes ‘Wie Gehts’ (ginger beer & rum) ‘dirndl’ (German red berries & vodka cocktail) along with German wines and prosecco plus imported beers from Munich and selection of niche craft beer and cider.